She was the daughter of James Thomas John Bean and Elizabeth Taylor. Married Name 1801 As of 7 October 1801, her married name was Shelley. 1798 Elizabeth Bean was a passenger aboard HMS Buffalo which sailed from EnglandG in 1798 and arrived in Port Jackson on 3 May 1799. Article According to Elizabeth Bean's death certificate - she was 96 when she died at Parramatta. However, her maiden name in the death certificate is shown as Elizabeth Kirshaw, this is incorrect. Her father was James Thomas John Bean and mother Elizabeth Taylor. At the time of her death, she was survived by one son and one daughter. Three males and two females deceased. The informant for the death certificate was her son-in-law W. Mansfield. In the Australian Index 1824-1842 Vol. 19 ML "SHELLEY, Elizabeth - Parramatta - Land Grant to issue. A., 23 -9- 1831"
Same source - "SHELLEY, Elizabeth - Land Grant, Parramatta A., 13.4.1832." Same source - SHELLEY, Elizabeth - Subscriber to Parramatta Weslyan Chapel Fund - A., Aug, 4th 1837 p. 1"
Same source - SHELLEY Mrs - Parramatta - Signs petition to Dr Sherwin. A., 26-8-1829"
Sydney Gazette 23 August, 1822 - " To the Editor of the Sydney Gazette - Sir, I trust my communication will not be deemed an intrusion either upon you columns, or your Readers. Something within me exists, as a prompter, to impel me before the Public - I have often looked upon the wretchedness of the poor New Hollander, and sighed for an alleviation of his distress. There now appears some prospect of good, according to the reply to Philanthropus. A certain paragraph in the communication constrained me to visit the Native Institution; and I was astonished, beyond measure, at the proficiency of the children under the tuition of the Governess, Mrs Shelley. The Institution did not contain more than twelve children. This diminutive numbers is the result of having married several of the females, who have been settled at Boongarruuby; and death has thinned their ranks. The few, however, that remain, bear ample testimony to two important facts: 1 - They have not made the proficiency to which they have attained without the most assiduous care of the Governess. From the little knowledge I possess of the blacks, I think myself competent to pronounce, with decision, on their character. They possess a vagrancy of mind that bears a strict analogy to their vagrancy of body. And those who have attempted merely to domesticate ONE black, and to make, him contented with a local habitation, will immediately perceive, how constant that application must have been on the part of the Governess, that has effected wonders, so extraordinary upon twelve. 2 - That these Aborigines posses powers of mind that may be greatly enlarged and improved. It is true that an excessive darkness seems to becloud their intellects, and apparently forbids the approach of intellectual light. But, it is very evident that this darkness is only apparent. I am fully convinced, that we have altogether erred in our estimation of the blacks, because we have inferred their total darkness, by comparing it with the effulgence of our own light. There is certainly a diversity in human minds, and much more may be expected from some of these natives, than from others. And as this same remark is applicable to the whole of the human family, does it not follow, if the tuition of the rising generation be perseveringly attended to, that we shall see from among these Natives, ornaments to political, moral and religious society. Much praise is due to Miss Shelley for the great attention she has paid to the female part of this little company. Nothing but seeing can prove a proper source of believing how much has been effected. If a company of Ladies and Gentlemen, would form themselves on a plan of paying regular visits to these children, doubtless their improvement would be greatly facilitated. There is no lack of persons in Parramatta of sufficient respectability to afford a little time for this purpose: and their little endeavors would produce great emulation in the minds of the children. This measure, in my judgment, would effect a change so mighty in the natives, generally, that they would send their children to the Institution, and the respectable Public would be insensibly drawn, to co-operate with All mighty God, in restoring to this moral image a people, the most degraded in the human family. Yours &c Aneradelphos.4"
Religion Elizabeth Bean and William Shelley were Church of England. [S82] Letter, David Wright to Hazel Joyce Punton, 1990. [S2] Index of BDM records, NSW BDM, Denomination: Church of England; Parish: Parramatta, St John's; Registration Year: 1801;Volume Reference: V1801502 3A. [S397] Michael J Mecham, "The Mecham Family," e-mail to Robert Mote, 19 August 2003. [S62] Geof Shelley, Shelley/Bean tree, Endnote 2. Death 5 November 1831 Rose Dunn died on Saturday, 5 November 1831 at Parramatta, NSW, AustraliaG, at age 45; according to Lynn Smith. Death 6 November 1831 She died on Sunday, 6 November 1831 at Sydney, NSW, AustraliaG, at age 45; according to Jean Stewart. Married Name 1804 As of 10 October 1804, her married name was Dunn. 1798 Rose Bean was a passenger aboard HMS Buffalo which sailed from EnglandG in 1798 and arrived in Port Jackson on 3 May 1799. [S2] Index of BDM records, NSW BDM, Denomination: Church of England; Parish: Parramatta, St John's; Registration Year: 1804;Volume Reference: V1804604 3A. [S139] Perry McIntyre & Adele Cathro, Thomas Dunn's Descendants, page: 32. [S4] M R Sainty and K A Johnson, NSW 1828 Census, 132. James Thomas John Bean Jnr. He was the son of James Thomas John Bean and Elizabeth Taylor. Marriage 18 April 1814 James Thomas John was married to Esther Short, daughter of Patrick Short and Maria Sarah Kelly, on Monday, 18 April 1814 at St Phillip's Church, Sydney, NSW, AustraliaG. Death 29 May 1859 James Thomas John Bean Jnr. died on Sunday, 29 May 1859 at Gunning, NSW, AustraliaG, at age 71. 1798 James Thomas John Bean Jnr. was a passenger aboard HMS Buffalo which sailed from EnglandG in 1798 and arrived in Port Jackson on 3 May 1799. On Friday last, John Holmes, convicted of arson at Campbelltown, was executed pursuant to his sentence. When on the scaffold, the rev. Mr Therry addressed the Under Sheriff and enquired whether he would be permitted to communicate the prisoner's confession to the numerous assemblage of persons who were collected to witness the execution. Immediate assent was given and Mr Therry then stated that the unfortunate culprit acknowledged his guilt, as well as the justice of his sentence; that he had committed many crimes, but sincerely hoped that God had forgiven him, as he freely forgave all those by whom he had ever been injured. The prisoner then addressed the spectators himself earnestly entreating that they would take warning by his fate, and avoid the evil consequences of bad company which had brought him to an untimely and disgraceful end. The Under Sheriff expressed himself gratified at hearing a declaration from the prisoner which must be so consolatory to himself, and so gratifying to his friends and all present. Holmes then joined in prayer with great devotion and in a few minutes the drop fell. After hanging the usual time, his body was earnestly requested by many persons, and Mr Prorit directed it to be delivered over to his friends on condition that it should be interred on the evening of the same day, as he was aware that they were desirous of having a wake over the body, which in all probability would have occasioned a disturbance in the town at night. A neat Coffin was provided by his friends and on the evening the corpse was followed to the grave by a numerous train. Family-History You can read more about the Bean History by clicking here. Article 1814 James Thomas John Bean Jnr. was granted 80 acres of land in 1814 at Airds, near Minto, NSW, AustraliaG. In September 1824 he wrote to Sir Thomas Brisbane to say that the land was now in cultivation with the exception of a few acres and that he had fouteen head of horned cattle, and that he would request a further grant of land to support his family, which consisted of his wife and four children. He was supported in his application by William Howe and the assistant chaplain who attested to his good qualities. As Howe wrote "he and his family are remarkably industrious and respectable". Another memorial was sent on 24 November and added that he now also supported two convicts, Jacob James and John Wenham. James was successful in having his grant extended to 300 acres and received a further 200 acres in the Brisbane Waters area of Northumberland. Article 19 October 1831 He was granted 80 acres at Menangle (Grant No: 507) on 19 October 1831. The property was later called "The Beehive." [S6] Marilyn Rowan, "Transcription of B, D or M," transcription to Robert Mote. [S2] Index of BDM records, NSW BDM, Parish of Birth Registration: Sydney, St James'; Registration Year: 1822; Registration Number: V1822468 16. She was the daughter of James Thomas John Bean Jnr. and Esther Short. Burial 10 December 1921 She was buried on 10 December 1921 at Western Road Cemetery, Parramatta, NSW, AustraliaG. Married Name 1852 As of 4 March 1852, her married name was Thornton. [S83] Letter, John Lambeth to Robert Mote, 21 November 1990. [S6] Marilyn Rowan, "Transcription of B, D or M," transcription to Robert Mote, Volume 18 No 639. [S2] Index of BDM records, NSW BDM. Marriage 13 June 1814 He married Elizabeth Bradley, daughter of Thomas Bradley, on Monday, 13 June 1814 at St John's Church of England, Parramatta, NSW, AustraliaG. One of the witnesses was Esther Harley, the daughter of Thomas Bradley whose family accompanied the Beans to Sydney on the Buffalo. Death 24 October 1834 William Bean died on Friday, 24 October 1834 at Sand Hills To Botany Bay, NSW, Australia, at age 42. 1798 William Bean was a passenger aboard HMS Buffalo which sailed from EnglandG in 1798 and arrived in Port Jackson on 3 May 1799. Article 1814 William received a grant of 30 acres on the recommendation of Mr Cowper in 1814. Article 21 December 1819 There was much excitement when the first European families arrived to take up residence. The flat-bottomed punt laden with the settlers and their chattels was towed into Kerikeri by two Maori canoes on the morning of 21 December 1819. Those first settlers were the Rev. John Butler, his wife Hannah, their eighteen-year-old son Samuel, two-year-old daughter Hannah, and their servant Richard Russell; James and Charlotte Kemp; William and Margery Puckey, their son William Gilbert aged fourteen years and three daughters, Caroline, Elizabeth and Jane; Sarah and William Fairburn; William and Elizabeth Bean with their young son William, born in Australia in 1817 and their very young baby George Thomas, born at Rangihoua on 21 October. On the foreshore, near where the Tea Rooms are today, was a blacksmith's shop, 21 feet by 15 feet and a long building, 60 feet by 15 feet, designed to be a store. Charlotte and James Kemp and Francis Hall moved into the blacksmith's shop while the others, eighteen people in all, took up residence in the store. Living in such crowded and primitive conditions, carrying water from the nearby stream, cooking (at first) out of doors must have been very trying, particularly for the women. For the young mother, Elizabeth Bean, nursing a two-week old baby with another very young child, it was particularly stressful; then, some six months later their three-year-old, William, died (12 July 1820). Three months after their arrival, Sarah Fairburn was delivered of a son, Richard Alexander, on 29 March 1820. Two of New Zealand's oldest buildings are situated in the Kerikeri Basin. Kemp House and the Stone Store are the only survivors from the Church Missionary Society's second Anglican mission to New Zealand, founded in 1819 on land granted to the Reverend Samuel Marsden by the powerful Nga Puhi chief, Hongi Hika. Occupation William Bean was working as a carpenter as well as farming his land. Article 1824 In 1824 William petitioned Sir Thomas Brisbane for an extension to his 30 acres which he had cultivated and on which he had fourteen head of horned cattle. 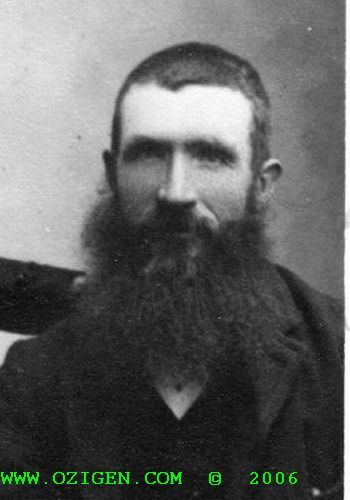 Samuel Masden described him as an "industrious man". He was granted the extra land in July 1824. Article July 1825 William applied to Sir Thomas Brisbane in July 1825 for a building allotment to build a four room cottage near Brokenback Bridge, as he was one of the contractors for the steam engine to be erected there. William was granted 80 acres at Menangle (Grant No: 509). on 19 October 1831. This property was later called "Mount View." [S366] John Armstrong, "The Beans in NZ," e-mail to Robert Mote, 30 May 2003. Burial Mary James was buried at St John's Church of England, Parramatta, NSW, AustraliaG. Birth 3 September 1829 She was born on Thursday, 3 September 1829 at Windsor, NSW, AustraliaG. She was the daughter of Samuel James and Ann Bean. Death 17 August 1841 She died on Tuesday, 17 August 1841 at Castle Hill, NSW, AustraliaG, at age 11. [S43] T S New, New Family History. Birth 6 September 1833 Esther James was born on Friday, 6 September 1833 at Baulkham Hills, NSW, AustraliaG. Marriage 30 October 1854 Esther was married to Richard Baker Gilbert on Monday, 30 October 1854 at St Matthews Church, Windsor, NSW, AustraliaG. Married Name 1854 As of 30 October 1854, her married name was Gilbert. [S2] Index of BDM records, NSW BDM, Place of Registration: Parramatta; Registration Year: 1923; Registration Number: 21010. Death Ann Crossley died at AustraliaG. She was the daughter of Jeremiah Crossley and Sarah James. Death 9 July 1922 Jane Crossley died on Sunday, 9 July 1922 at Laidlaw Street, Yass, NSW, AustraliaG, at age 75. Married Name 1865 As of 2 January 1865, her married name was Cox. [S151] Grieves Family and Yass Indexes, online http://members.iinet.net.au/~sgrieves/grieves_family.htm, Yass Courier Index, page 7 of 31. 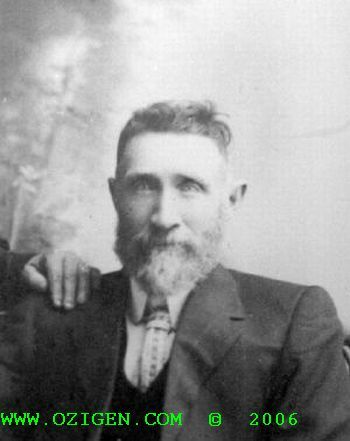 He was the son of Jeremiah Crossley and Sarah James. Death 3 November 1911 James Crossley died on Friday, 3 November 1911 at Yass, NSWG, at age 62. [S249] Letter, Patrick Martin McCormack to Robert Mote, June, 2001. [S2] Index of BDM records, NSW BDM, Place of Registration: Yass; Year: 1889; Number: 36355. Death 31 March 1908 Lucy Crossley died on Tuesday, 31 March 1908 at Gallops Creek, Yass, NSW, AustraliaG, at age 57. Married Name 1871 As of 23 January 1871, her married name was Goodger. 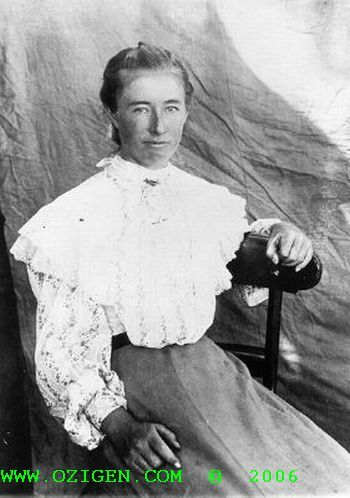 Death 11 November 1934 Esther Crossley died on Sunday, 11 November 1934 at Campbelltown, NSW, AustraliaG, at age 81. [S2] Index of BDM records, NSW BDM, Place of Registration: Yass; Year: 1857; Number: 12436. Death 5 February 1952 Ann Maria Crossley died on Tuesday, 5 February 1952 at Yass, NSW, AustraliaG, at age 92. Hezekiah Crossley was the youngest son of Jeremiah Crossley. He spent all of his life at Wargeila and died within a mile of where he was born. In his young days he shepherded sheep and was very fond of hunting kangaroos, native cats, possums and native bears. Hezekiah took up land adjoining his father's and married Sarah Ann Martin. They started their lives together in two rooms with a bark roof and earth floor. He had no education but his wife had a little and did any clerical work that had to be done. Quite a few people could not read so the police came around periodically and collected the returns. They usually stayed with the Crossleys for a night or two while collecting around the district. Hezekiah and Sarah had 12 children. As the family grew, and most people had large families, and churches were few, a minister would come from Yass to worship in Sarah Crossley's home. Eventually the house was too small and it was decided to build a Union Church on Hezekiah's property. There were three denominations. The church was built of slabs with an iron roof. He did a large room for himself used as a dining room and kitchen where they used to hold dances. His wife Sarah used to play the concertina and sometimes there would be a violin player who came to play for special ocassions. [S2] Index of BDM records, NSW BDM, Place of Registration: Yass; Year: 1945; Number: 13569.